Scientists agree the sun will die in approximately 10 billion years, but they weren't sure what would happen next... until now. 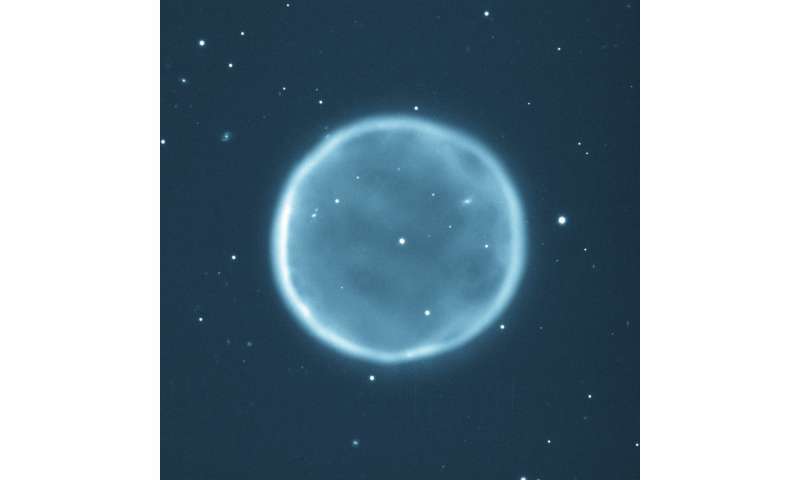 A team of international astronomers, including Professor Albert Zijlstra from the University of Manchester, predict it will turn into a massive ring of luminous, interstellar gas and dust, known as a planetary nebula. A planetary nebula marks the end of 90% of all stars active lives and traces the star's transition from a red giant to a degenerate white dwarf. But, for years, scientists weren't sure if the sun in our galaxy would follow the same fate: it was thought to have too low mass to create a visible planetary nebula. The research is being published in Nature Astronomy on Monday 7th May. Prof Zijslra explains: "When a star dies it ejects a mass of gas and dust—known as its envelope—into space. The envelope can be as much as half the star's mass. This reveals the star's core, which by this point in the star's life is running out of fuel, eventually turning off and before finally dying. "It is only then the hot core makes the ejected envelope shine brightly for around 10,000 years—a brief period in astronomy. This is what makes the planetary nebula visible. Some are so bright that they can be seen from extremely large distances measuring tens of millions of light years, where the star itself would have been much too faint to see." The model also solves another problem that has been perplexing astronomers for a quarter of a century. Approximately 25 years ago astronomers discovered that if you look at planetary nebulae in another galaxy, the brightest ones always have the same brightness. It was found that it was possible to see how far away a galaxy was just from the appearance of its brightest planetary nebulae. In theory it worked in any of type galaxy. But whilst the data suggested this was correct, the scientific models claimed otherwise. Prof Zijlstra adds: "Old, low mass stars should make much fainter planetary nebulae than young, more massive stars. This has become a source of conflict for the past for 25 years. "The data said you could get bright planetary nebulae from low mass stars like the sun, the models said that was not possible, anything less than about twice the mass of the sun would give a planetary nebula too faint to see." Professor Zijlstra added: "We found that stars with mass less than 1.1 times the mass of the sun produce fainter nebula, and stars more massive than 3 solar masses brighter nebulae, but for the rest the predicted brightness is very close to what had been observed. Problem solved, after 25 years! "This is a nice result. Not only do we now have a way to measure the presence of stars of ages a few billion years in distant galaxies, which is a range that is remarkably difficult to measure, we even have found out what the sun will do when it dies!" "Scientists agree the sun will die in approximately 10 billion years"
Did you mean scientists agree the lifespan of our sun is 10 billion years, and that the sun is about halfway through that lifespan? "A planetary nebula marks the end of 90% of all stars active lives and traces the star's transition from a red giant to a degenerate white dwarf." This sentence is confusing. If the vast majority of stars are red dwarfs, and none of them are even close to the end of their life, nor do scientists predict they form planetary nebula never mind red giants, how do you explain this line? This is wrong. Very wrong. Ptaah: "To be said straight away is that the terrestrial scientists err to a large degree in regard to the Sun's lifespan, because it is a dying star and its real remaining lifetime accordingly amounts to only 1,500,000,000 to 2,500,000,000 years". When our sun dies Thanos will die. But since nobody explained to him how life works, populations throughout the universe would have recovered only a few generations after he decimated them, meaning that by the time the sun dies nobody would know who he was anyways. Sequel - what he should have done is kill off half the species. Then evolution would have only replaced them after a few 100,000 years. Still, nobody would remember him so meh. You must be even more dyslexic than I am and I am bad enough and I am nearly always misreading things! That line refers to "red giant" and "white dwarf", NOT "red dwarf", which is not to be confused with either. I agree that part is very unclear. They shouldn't use the word "die" because in this context the meaning of "die" is totally unclear. "transformed" might be a better word? It's like asterism and naming star formations after animals because they look the "same". I like the thought that micro and macro worlds would really be the same. Like our solar system or our galaxy would be an atom and our visible universe would be somekind of molecule. I've spend numerous hours wondering this stuff and its implications but it does not make it true. To the topic: I wonder how sure they really are about the age of sun and how are they so sure about the lifetime of stars? "What happens when our Sun dies?" Well, nothing! That's how you know it dead. Unless, over the next few hundred billion years, the stub remnant of Sun gets recycled. Like your beer cans? I've spend numerous hours wondering this stuff and its implications but it does not make it true. Why start calling names? Your comment was not any better. At least I wrote something that was on the topic.